In doing some research for an ebook I wrote recently, I was shocked to discover this statistic: since 1965 over 10 million chemical compounds have been created in labs! That’s a LOT of new chemicals that we can potentially be exposed to. It’s true that some of them have little or no adverse affect on human health, but others can cause sickness or even death. I won’t go into all the details in this article, but I do think it’s worth sharing a few stats. According to Linda Berry, ND. , author of “Internal Cleansing,” 2800 chemicals are added to our foods everyday, 700 toxic chemicals show up in drinking water, especially the supposedly “pure” water from plastic bottles. Plus 800 proven neuro-toxic chemicals are used in common cosmetics and perfumes and 500 toxins can be found under kitchen sinks and in laundry rooms. But these are just the most infamous. There are 100s of others that may be as dangerous. Given the sheer amount of chemicals available combined with poor regulation in the cosmetic, food and clothing industires, it’s little wonder that people suffer from diseases linked to chemical toxins in epidemic numbers. But I don’t mean this to be a gloomy article. In fact, I believe we can do something about this situation – it’s up to each one of us to eliminate as many dangerous chemicals in our lives as possible. One of the first things I’d recommend is to go through your entire house and get rid of as many chemical products as possible. This includes food, cosmetics, cleaning supplies and even clothing. If you don’t think something as simple as eliminating the chemicals in your everyday environment would make much of a difference, consider this story from environmental toxoligist, Peter Dingle. I’ve read at least 25 similar stories about chemicals in cosmetics, foods, water and even clothing over the past few years. And I have no doubt that there are 1000s more like them. In my opinion, the best way to protect yourself is to educate yourself. Find out what chemicals are considered most dangerous and read labels so that you can avoid products that contain them. 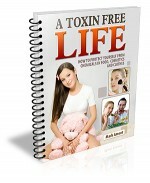 You can do this on your own if you put in some research time, but if you’d like to get the information quickly and all in one place, pick up a copy of my ebook, “A Toxin Free Life.” In it I list the most dangerous chemicals in cosmetics, household products, foods, clothing plus give practical strategies on how to get them out of your life.